The following article was written for WWII Reenactors Magazine’s Christmas issue, which was never printed. I wanted to share it with you all regardless. Apologies for the festive content, but thought it would be useful reading for present buying at any time of year! Tis the season to be….stumped at what to buy WWII enthusiasts and 1940’s passionistas (like my wording?). I thought it would be the easiest thing in the world by quoting the simple words “Just get me something Art Deco or 1940’s…” How hard can it be? So when my eyes are scorched with the site of such festive offerings as Scooby Doo bubble bath and a questionable ex-rental copy of Freddy Got Fingered, my clenched jaw grin does nothing for my yuletide spirit. So for those of you who are struggling to buy reenactors and collectors suitable Christmas gifts, you will find this page ripped out of WWII Reenactors Magazine and thrust infront of your nose along with your car keys. “With three Kings of orient are, smoking on a rubber cigar…” Those who are partial to a death stick or four (apparently they soothe your throat and give you a movie star voice if the old advertisements are correct!) will be thrilled to receive a 1940’s cigarette case for carrying to events. There are many different styles out there, from trench art to novelty patriotic, so head on out to the next flea market, antiques centre or Ebay. Remember that cigarettes used to be a lot smaller, so that these old cases are more for display, role ups or business cards. You may even find a women’s compact that includes a cigarette case in the design. And what about an ashtray for the home? Neither Mr. Mew or I smoke, but we do have a small collection including a Winston Churchill ashtray and a bakelite lamp with a match holder and ashtray moulded into the base. You may also find some matchbox covers made from enamel and metal baring the photos of great WWII leader or service men and women on the sides. “It’s the most wonderful time, for a beeeeeeer…” Drinking gifts for those who like a tipple! A couple of bottles of Spitfire Ale twinned with an enamel mug and WWII bottle opener can be a fantastic offering. Dress you gift up by presenting it in a wooden crate filled with hay or you could even photocopy WWII newspapers on A3 paper and use it as gift wrap! “A beautiful site, we’re happy tonight, walkin’ around in women’s underwear….” Now for the ladies! A 1940’s powder compact perhaps? Some seamed fully fashioned stockings from What Katie Did, or perhaps an original tilt hat or handbag! You will find many vintage clothing shops online, but sometimes auction sites are still where you can pick up the best bargains. Even if the seller doesn’t list UK shipping, you can email and beg. In most cases I have found that they will ship internationally! What about a pretty top from Heyday Online? Some things are currently around £20 in the sale, so this is the perfect time for early Christmas shopping (and won’t she be impressed at your organisation this year!). A 1940’s sweetheart brooch or necklace can also be a wonderful idea. Sometimes these were made by soldiers to send back to their girlfriends and wives in WWII and you can find some lovely unique pieces at very reasonable prices. Knowing that they were made for a loved one makes each item a 1000 times more special than your Elizabeth Duke collection *shudder*. Why not pick out a reverse carved lucite brooch? Some of these were made from the windscreens of crashed aircraft in WWII and sold for the war effort. From roses to spitfires, these brooches are incredibly wearable and a fun thing to collect. Why not present it in an old jewellery box too? If you eagerly wish/ are forced by hair and teeth to go clothes shopping with your partner, make a mental note of sizes that she tries on and check online for its chest, waist and hip conversion. Vintage sizing is a lot different (especially when you get to 1920’s garments or international sizing), so knowing the equivalent in inches will help you buy items of clothing such as vintage dresses, suits or jackets. Just remember that you can take things in that are a little too big, but you can very rarely led things out that are too small, so play safe with your sizes! “On the first day of Christmas my daddy gave to me, a Barbie and Im 33…” Childrens gifts are tricky. You don’t want your 1940’s themed home full of pink and garish blue plastic toys, but thanks to exciting TV advertisements and playground conferences about the latest craze, these flashing, beeping, peeing, talking, squeaking land fill accessories are all that they can think about. There are some super vintage and vintage repro toys out there. From train sets (imagine creating a WWII electric train set in your home for the kids? ), military airfix sets, beautiful wooden toys, even doll making kits. Traditional dolls houses can teach your little ones good house keeping on a miniature scale and the fact that you may come home every so often with a tiny wooden dresser or electric light fitting will make them feel like every day is a special occasion. Why not build an anderson shelter for the outside! Just remember that a lot of vintage toys will be painted with lead paint, so if your little ones are partial to seeing how many toy soldiers they can fit in their mouth at once, you may need to respray the items with child free paint. You may also wish to teach your children that Bernard Montgomery (plastic or not) would rather not survey the gruesome terrain of their molers. For those who are a little strapped for cash but not strapped for time, why not use your arts and crafts talents to create personal gifts of the ‘make do and mend’ kind! Pull out some ration recipes in an old book or online and attempt to recreate the biscuits or cakes from WWII. Grab an old felt beret and stitch a needlepoint design of flowers or swallows, or make an old fashioned toy. Another great idea is to buy a box frame and fill it with WWII insignia. You don’t have to use the originals, just go somewhere that can reproduce/ photocopy your images in high quality. From ration books to medals, to old family photos; you can create wonderful displays for friends or family with minimum effort. Why not get your Grandad’s medals framed for your parents or create a WWII military uniform for your son’s teddybear (this was done for me by a great friend and I was absolutely thrilled!). So hopefully I have given you a few ideas for Christmas, Birthdays and more. Remember that you don’t have to spend a fortune, there are always bargains to be had. 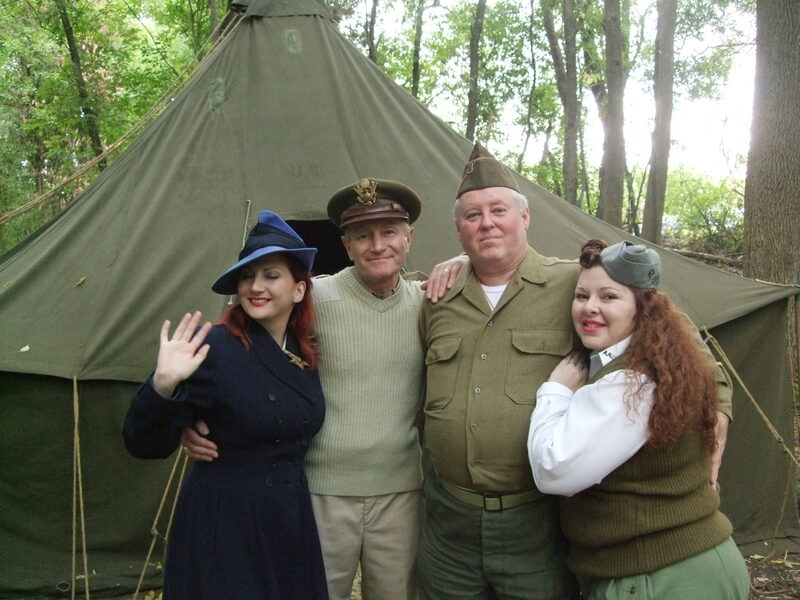 Pre-plan next year and buy things at WWII events to hide away for special occasions! This will spread costs and save your pocket from the inevitable Christmas rush. I wish you all are wonderful Christmas and a purrrfect New Year. Thank you for your friendship, readership and support through a whole year of exciting events. Next year promises to be even more exciting! Posted in Day to Day and tagged 1940's, articles, birthday gifts, christmas gifts, gifts, gifts for children, gifts for her, gifts for him, gifts for men, gifts for women, kitten von mew, pinup, pinups, vintage gifts, vintage girls, WW2, WWII, wwii reenactors magazine. Bookmark the permalink. Today I thought I would bring you a selection of 10 of my images from 2011 and reasons why I have chosen them! This was taken at Christmas (obviously) by Matt Keller and was one of the very few shoots I did in winter time last year. I like this image because it reminds me of a lovely Christmas and rounding off a tough year with positivity and hope for the future; the engagement ring for obvious reasons, a glimpse of one of my handmade decorations symbolising my new found love for crafts in my spare time, the red white and blue are a nod to the patriotic WWII themes dotted around the house and the necklace was my Grandmothers, but it actually reminds me of the colours of my Grandad’s tobacco pipe. This was a little moment captured by Les Auld at War and Peace of Mr. Moo and I dancing together. We are never stoney faced when we dance. Whether we are laughing and smiling or our eyes closed, it means a lot to both of us. It was a lovely surprise to stumble across this image online and it has become one of my favourites. Taken by Oli Scarff, this was a very impromptu moment after I had just done a press shoot for the Southbank Centre in aid of the Festival of Britain. I had just got changed into something more comfy and Richard and I had headed down from the roof to the first floor outdoor area. I took off my shoes to cool my feet but Richard grabbed my hand and pulled us both into the freezing Appearing Rooms fountain. We danced around in the water, getting absolutely soaked; it was so cold! A few of the press photographers came down the roof steps and one snapped some great images of us dancing. I later contacted Ghetty Images and got 3 of them framed. They are now on our livingroom wall and make me smile. This image, although fantastic in it’s own right, reminds me of how precious true friends are. It is through the hard times that you find out which people in your life are really there for you in heart as well as in presence and Lisa of Candee Photography is one of those. My closest friend; we always have a giggle on shoots and although disagreements are few and far between, we find ways to overcome difficulties or awkward situations with ease. We first met on a Sakura Designs shoot, where I had come to London to model hats and she was the photographer. Quiet, rather shy, but a smile to knock the clouds of the highest mountain, we worked well together and I was sorry to have to leave early. Since then we have done countless shoots, including the one above which is for my 2013 calendar. I don’t know what I would do without her and Jacob. Yes another image taken by Les Auld at War and Peace! This was the debut of my Carmen Mewanda act and a daunting period for me after weight gain through illness. Of course as soon as I got on stage, I loved every moment. It’s funny thinking how upset and unconfident I feel an hour before and how I adore it all once Im up there. I chose this image because of what is actually going on that you cannot see. Although a child friendly version of the act, I managed to vacate the marquee of a party of 30 school children and 2 female teacher…leaving one male one behind and a lot of laughter from my friends Lee and Adam. I couldn’t help but laughing at the teachers nervously shoving the children out the door, even though I was wearing more than a swimsuit on a beach. I flipping love this snap. Taken by Richard and War and Peace, I was strutting around in my new vintage hat, wearing Heyday Online trousers and blouse and everyday went to see my friend Shona at her stall. She is such a lovely girl and I model for her when I can. 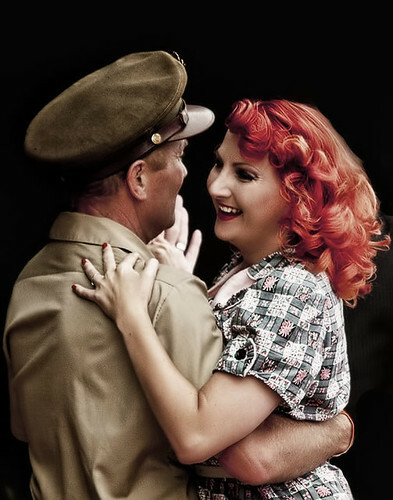 Another candid image taken at Goodwood Revival. I have chosen this image as it was the last day and I was so very tired, losing my speaking voice and suddenly went into a rather silly mood. I think all us entertainers were getting little exhausted and I ended up sitting on my ‘karaoke crate’ to rest my aching feet and sing in one of the VIP areas. As I sang White Cliffs of Dover, one of the comical cleaning ladies was passing and I thrust the microphone at her. She instinctively started singing and it was a really lovely moment. Not chosen for the quality of image, but more the people in it. My dear friends Don and Stephanie, who I bonded with through a sad passing of one of my fans. Also because you cannot tell that I am suffering from Laryngitis, Sinusitis, a temperature of 104 and jetlag. Posted in Day to Day, Events and Performances and tagged beltring, blogs, candee photography, events, friends, goodwood revival, images, kitten von mew, photos, pinups, richard von mew, vintage girls, war and peace show. Bookmark the permalink. I have been terribly lucky with most of the events I have attended so far. Although subject to a dust bath at War and Peace, I would rather this than an impromptu mud wrap from a passing jeep! Although hot and sometimes itchy in their WWII uniforms, men have it reasonably easy at such events as the more dirt they pick up (minus Ketchup, toothpaste and coffee), the more authentic their outfits look. Less can be said as a lady trying to look the epitome of glamour as you stagger around open fields in your 1940’s heels and hippedy-hop down dirt tracks impressed with deep tyre marks. Sometimes you spend more time making sure you don’t fall down than you do enjoying the event. I cannot count the number or times I have staggered across a potholed track in my 40’s outfits, having to save myself from embarrassment by either ending in a light jog or looking over my shoulder and tutting loudly at the lack of health and safety for ridiculous shoe wearers such as myself…It’s as if military events weren’t made for high heeled shoes! The horror! I always have my survival kit at events – Red lipstick is a must. Even if you wear the 24 hour stay stuff, I personally find myself eating it off my lips, so an emergency supply is always a good idea. Next, a loose powder incase of a down pour of heatwave. I actually use a perfumed powder, which is more like a scented talc on a standard powder puff. I load the puff with powder before I go out and pop it in an empty compact that I pop in my handbag. If you are wearing false eyelashes, bring the glue with you as they may decide to become unstuck at the corners and leave you looking as if a couple of spiders are taking a kip on your eyelids…Next up is the inevitable first aid kit of paracetamol, a couple of plasters in case of blisters and any medication. I bring a small compact camera and my phone of which I keep discrete. There’s nothing worse that ruining the vintage ambience by clamping a modern phone to your ear or texting unnecessarily. Embrace your surroundings and people watch. Remember life before emails and mobile phones for a weekend! Stockings can be a real issue at events. You only need to catch your fully fashioned nylons whilst posing on a half track and that is a £10 stocking down the drain. They aren’t cheap you know boys, unless a Spiv can get you a good deal! I cheat on occasion and wear special fully fashioned stockings that have elastine in them. I pick them up on occasion in second hand shops in the packet. Made in the 60’s, they still feature the classic keyhole and seam to prove that they have been made on the original machines, but have the benefit of a comfortable fit, no creasing at the ankle and they are little more hard wearing than precious nylons that you can save for dinners, dances and less hazardous pursuits. Don’t forget to slip a spare pair in your bag! If you are feeling brave and heading out in a scrumptious pair of heels, just remember how much walking there is at a lot of outdoor events. If your partner is gallivanting around like a 5 year old at the Wacky Warehouse, just let him go and play and take your time. The last thing you want is a broken ankle after you rush over to stop him buying an elephant foot plant pot for the living room. Sitting serenely on the grass to ‘take in the scenery’ as your poor throbbing feet have a breather is no bad thing. You can also take these resting points as a water stop as keeping hydrated is very important in the summer season. I always make sure I have a flat pair of shoes in the car and a pair of 40’s Heyday trousers, so that if my outfit does get a little vexatious, I can slip into something more comfortable but equally as fitting to the occasion. Rocket Originals saddle shoes are my usual choice and great for dancing in or if it starts to get chilly! So you have your handbag sorted and a change of clothing in case of bad weather or uncooperative toes. What are you going to wear? If you are stepping out in a vintage dress then CHECK YOUR SEAMS! Im not talking stockings, I mean the seams of your garments. I once bought a gorgeous vintage dress I was going to wear at a USO Dance it looked almost unworn. When I got to the venue I swung my legs out of the car and hoisted myself out of the car, only to hear the unmistakeable sound of my dress tearing at the back. On another occasion I was at my friends wedding in a vintage dress I had tailored in and as I through myself into the spirit of catching the bouquet, the original thread seams that had not been touched came apart and opened top to bottom at my sides. I was clutching the bouquet but suddenly wearing a silk tabbard. If you are planning to dance, especially Lindy Hop, think of your underarm seams, hips and back. Go over them with a sewing machine and new thread if you have time. To avoid sunstroke, headaches and as a great excuse to buy more things, make sure you have a headscarf or sun hat to shade your head in hot weather and don’t forget those sunglasses! The more authentic accessories you can add to your outfit, the more fantastic you will look. There is nothing like seeing a lady strolling around an event in an iconic hat. Lastly, the hair. A strong hairspray is a great idea and I use Tresemme Freeze Hold in a white can. If I am pincurling my hair, I will spray it on as a temporary setting lotion before curling. I spray my hair again once I have completed my style. It is super stuff as my hair doesn’t like holding curl at all and aids my Victory Rolls to stay firm and resolute in gusts of angry wind. Posted in Events and Performances, Publicity and Media Announcements and tagged articles, beltring, events, kitten von mew, pinups, war and peace show, WW2, WWII, wwii reenactors. Bookmark the permalink. On Saturday Lisa from Candee Photography, Jacob, Richard, Papa Mew and I headed to Tysley Locomotive Depot to start a 2 day photo shoot for a 2013 calendar! Having done my research on the period of the trains, we matched 1940’s and 1950’s outfits according to the engine and had a tiring but very successful shoot. On Sunday we spent all day at the beautiful and very well kept Ansley Station on the Severn Valley Railway line. It was wonderfully quiet and I got to try my hand in the signal box, hand a token up to the engine driver and pose on the platform with the Station Master. Everyone was so accomodating, it was a real privilege! If anyone goes, head to the other opposite side where the beuatiful gardens are and take a look at the original Ministry of Food WWII milk pail near the bridge! Im excited about the most rediculous things! On the Saturday I got to debut a new corset costume made for me by Gaynor of The Garrison, sho has created the most amazing ATS corset costume out of original uniform pieces. Sabre Sales provided the insignia and the whole outfit went splendidly with the Shakespeare Express Steam Train! Many thanks to Neil Howard and the team for a great weekend. Posted in Day to Day and tagged 1940's, calendar, kitten von mew, locomotives, pinups, severn valley railway, trains, WW2, WWII. Bookmark the permalink. This is a brand new act that I have been toying with for around 5 years, but decided to do it in dedication and memory of my beloved ‘Grandad with the Pipe’ who flamed my passion for the 1940’s and who was the inspiration for this act in the first place! Pipe Dreams debuted at War and Peace 2011 and this family friendly version (the first time I had ever run through it properly!) was filmed by my lovely friend Lee Parker. 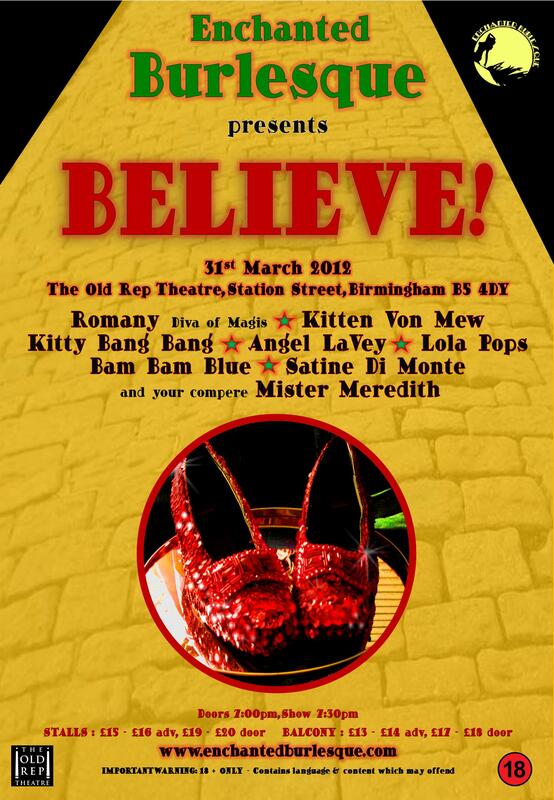 Posted in Events and Performances and tagged burlesque, kitten von mew, pinups, pipe dreams, striptease, videos, vintage pin up girls, war and peace show. Bookmark the permalink. 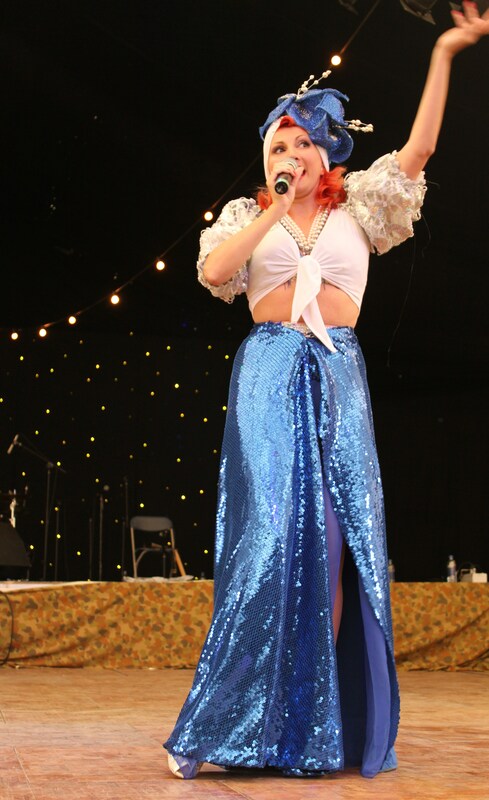 This video was taken by my great friend Lee Parker of my new Carmen Mewanda act that debuted at Wartime in the Vale this year. 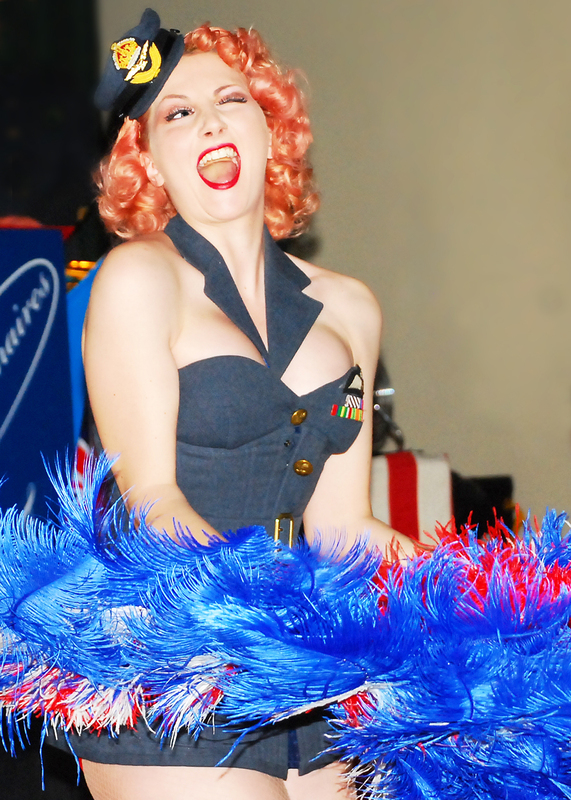 This clip was recorded on the Saturday evening at War and Peace 2011 with live singing and a fun strip tease. I hope you enjoy! Posted in Events and Performances and tagged blogs, burlesque, carmen miranda, kitten von mew, pinup girls, pinups, striptease, videos, war and peace show. Bookmark the permalink.